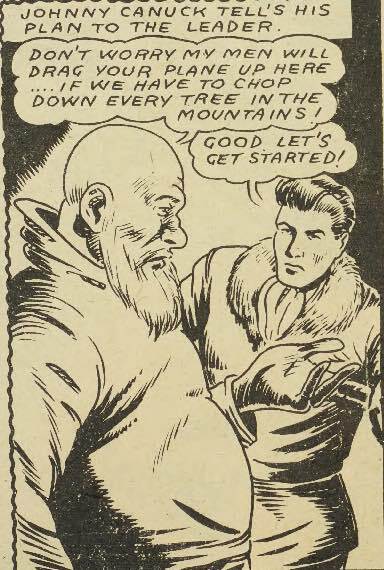 The representation of a Canadian identity in conjunction with its reception will be analyzed within the 20th issue of Dime Comics dating April 1945. One of many in The Canadian Whites, this comic’s inaccurate representations of the Japanese draw attention to the deliberate effort the artists put into depicting the “enemy” in order to establish a Canadian identity. The depicted Canadian identity seems to be a sense of superiority and innate goodness; the comic reveals itself to have strong opinions on a national identity and thus offers them to its audience: children. The wider context of the period outlines that “luxury goods,” including children’s comics, were halted as imports to Canada due to the War Exchange Conservation Act (Bell). Building a strong Canadian identity at the time was important for the war effort (Granatstein), which is why characters such as Johnny Canuck depict a Canadian “super-hero” saving the day. Johnny Canuck has no super powers, which sends the message that he is an ordinary Canadian. Tied with his ability to defeat the enemy, he is the Canadian identity: an Anglo-Canadian male, undefeatable despite his lack of superpowers. The comic works as a piece of literature for children that aided in their understanding of Canada’s role in the war effort (Zipes). Children did minor work to raise money for the war effort (Veterans Affairs Canada); this detail of the historical situation asserts that children were receiving a thorough education on Canada’s stance at war (Millar). Dime Comics no. 20 contains a “Canadian identity” that the education received by the youth of the time would have affirmed. This contributed to their consumption and engagement of the media because the same ideals were reflected in a trivial way. The disadvantageous portrayal of the Japanese depicts children of that culture as an “enemy,” this would have given rise to their poor treatment by other school children pre and post war. Currently, there is no review detailing the Canadian identity targeted towards children within their own medium of literature. This study will aid in understanding Canada’s history (WWII) in establishing an identity and its challenges in diversity, in relation to children through this specific medium. Figure 1. Bachle, Leo, (w,a). Panel from “Johnny Canuck.” Dime Comics, No. 20, April 1945, Commercial Signs of Canada, p.25-31. Bell Features Collection, Library and Archives Canada. In an effort to build a Canadian identity through these comics, the political stance of the artists was revealed through their characters. Leo Bachle’s Johnny Canuck (Fig. 1) is the working symbol of a Canadian: he appears to be Anglo, physically fit, and smart. Though he lacks any powers that would deem him a super hero, he still qualifies as one because of his quick thinking and tactics to beat the enemy. Bart Beaty discusses an element of super-heroes, identified by Richard Reynolds, that alludes to the idea that the behaviour of super-heroes is condemned from the law if and when their actions reflect their country’s best interest (428). Applying this to Johnny Canuck, he takes on the role of performing a coup d’état on the Nazis (Bachle 31), demonstrating Canada’s role in the war. The Canadian is the hero in this story, like many of the others in the same comic issue, and the featured Canadians are always Anglo. Beaty writes that the efforts of Johnny Canuck “overemphasiz[ed] Canada’s importance in the war” (430), notably regarding the writers agenda of engaging children readers with a political standpoint. In Dime Comic no. 20, Canadians are presented as superior to the Axis powers, with a certain focus on the Japanese. Johnny Canuck’s endeavours to win reflects the benevolent intentions of Canada – to beat evil. However, this comic is a piece of literature for children and therefore has complications within it when it displays only one type of Canadian. With the portrayal of an ideal Canadian through the discussed limited physical attributes, the “enemy” children were left out of the national identity, with the end of the war six months away. The depiction of this sort of Canadian identity leaves vulnerable the fact that Canada needed an identity established for it during the time (Beaty 438), the artists’ efforts in depicting one identity in the comic sends a skewed message to its children-populated audience: Anglo superiority. Receiving such information as a child during WWII had its consequences, primarily the treatment of the “enemy” and their children. Figure 2. Cooper, Al (w,a). Panel from “Barnacle Bull.” Dime Comics, No. 20, April 1945, Commercial Signs of Canada, p.8-9. Bell Features Collection, Library and Archives Canada. The negative representation of the Japanese can be highlighted in comics such as “Barnacle Bull,” in which they are depicted more like pigs than human beings (Fig.2). Their inappropriately presented physical appearance augments the Anglo-Canadian superiority. Further, it paints an image for the children reading these comics: the Japanese are outsiders. Laurel Lewey discusses the treatment and living arrangements of the Japanese during WWII in Canada. She writes that unofficial organizations deemed the Japanese a threat to the Anglo-Christian image of Canada and therefore they were a problem (Lewey 2). Their treatment was similar to those of Jewish descent in Germany with laws governing curfews and identification cards (Lewey, 6). The questioning of the loyalty of the Japanese by the Canadian government was evident, but the implicit ways that contributed to their harsh treatment include Dime Comic no. 20. Primarily, the medium intended for children offers no indication of racial inclusivity and therefore makes difficult for them to affirm the non-Anglo-Christian-Canadian as a Canadian. Over-exaggerated features as well as inaccurate representations both allude to the beliefs put in place about the Canadian identity, which as a result would increase the negativity received by the “superior” type of Canadian that has been represented. Lewey notes the terrible conditions the Japanese children lived in during the war, screaming while surrounded by little to no privacy and toxic fumes (6). This raises the question of post-war treatment, when these children were to return to the same schools and shared environments with the other children reading “Barnacle Bull.” Racism would have continued due to the message in children’s literature’s ideas of the Canadian identity and what it physically looks like to be an outsider. 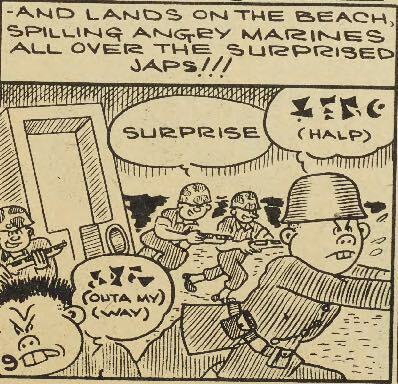 It is noted that “[t]he government’s Wartime Information Board actually perpetuated negative stereotypes of the Japanese national character” (Patrias and Frager 5), in relation to the medium of comics and its consumption as popular culture, these stereotypes are picked up. It is of significance to note that the perpetuation of stereotypes directly affected children, who are always the face of tomorrow, in ways that may be irreversible. The establishment of an exclusive Canadian identity makes for an environment in which racism can thrive in. This was especially harmful for children because they were not given an opportunity to think on their own and make decisions. What was presented to them as fact – the inherent evil-ness of the “other” – was not a fact whatsoever. Figure 3. Canada. National War Finance Committee, F. A. Hey gang! Broadsides 1940. Toronto Reference Library. Baldwin Collection. Public Domain. With war years came the expectation for children to contribute what they can to the Canadian home front. Education in schools reflected the needs of the war, with the viewing of patriotic films and curriculum based on Canada’s part in the war (Millar). 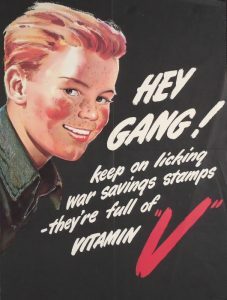 During this time children were encouraged to do their bit by buying War Savings stamps (Fig.3) and collecting metal scraps (Veterans Affairs Canada). In school, the objective of learning about the war served two purposes: to depict Canada’s commitment to winning the war, along with communicating to the youth about their nation’s values, perseverance, and the dedication to hard work (Millar). The fact that the education system offered to children during WWII formally conveyed background information on their country’s endeavors becomes evident. Though with hard work, comes the need to play. The Canadian Whites may have been this answer, offering a leisurely read about the concerns of their country. The comics could have allowed the children to put a face to the efforts of Canada in the war. The role of children could have been regarded as a helping hand during the time, though in Dime Comic no. 20 there is not a single trace of children; all the stories detail adults and their escapades. The exclusion of youth in children’s literature may reiterate their role in society at that time, enforcing an ambition for the children to replicate the heroes in the comics. With the already discussed complication of a narrow Canadian identity, came another form of patriotism learned at school. Children’s education would have influenced how they received the comic. Enemies they learned about in school were being reflected in the stories they read in an amusing way. 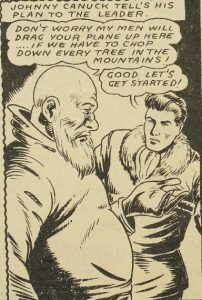 The “Canadian-ness” in the comic could have been a determining factor in its popular engagement with the young audience (Kocmarek 157) further working as a database of the events of the war. It would have been necessary that the comics reflect the general belief about war and the enemies of their society to avoid inconsistencies in ideas of patriotism. The majority of “good” characters in Dime Comic no. 20 reflect a Canadian background (Kocmarek 151), thus augmenting the image of a national identity. This worked in a way to supplement the efforts of the education system, and instilled the same notions in the mind of impressionable young children. A rise could have been given to hostile environments to children not reflected in comics or at school, situating the literature as an example of the root of a bigger problem. Figure 4. “A Jap woman waves at a distance window where the Japs were placed.” Toronto Star 1942, Baldwin Collection, Toronto Reference Library, Toronto Star Photo Archive. Toronto Star license. The Oxford Dictionary of English defines propaganda as “information, especially of a biased or misleading nature, used to promote a political cause or point of view” (Oxford University Press). The inaccurate depiction in Dime Comic no. 20 of the Japanese, reduced to superficial qualities, and the narrow Canadian identity dictate it a form of propaganda. This propaganda and exclusivity of a Canadian identity call to attention the fact that there will always be an “other” category of people that don’t live up to the enforced standards. As reflected in the comic, this exclusion was also depicted in newspapers (Fig.4). The caption’s derogatory reference to the Japanese in The Toronto Star depicts this exclusivity. The photo, presenting a real case of exclusion breathes air into the livelihood of it. With the Japanese being regarded as an enemy in the school curriculum, and being called “Japs” not only in the children’s comics but newspapers as well, reiterates the propaganda children were faced with. 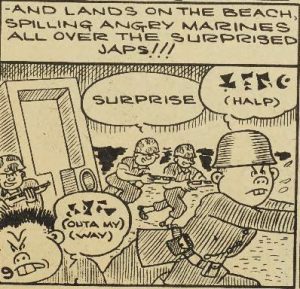 In the “Scotty MacDonald” comic a narration reads “concerned with the sole destruction of Scotty’s plane, the perplexed Jap…” (Cooper 21), this deduced the people of Japanese descent to their culture, but also associated them with a desire to harm. This form of propaganda aimed directly at children reflects the Canadian values at the time which included the establishment of the nation as a competing agent in the war. To gain the authority to be so, the Canadian identity had to be established for children in order to convey the beliefs necessary, not only to secure their aid but develop a sense of Anglo-Canadian superiority to fight the Axis power. Canada. National War Finance Committee, F. A. Hey gang! Broadsides 1940. Toronto Reference Library. Baldwin Collection. Public Domain.